Heiss, Anita (ed. ), Minter, Peter (general ed. 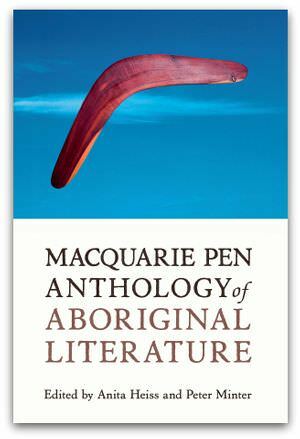 ): The Macquarie PEN Anthology of Aboriginal Literature. Allen and Unwin, 2008, RRP $39.95, ISBN 9781741754984. The Macquarie PEN Anthology of Aboriginal Literature is a 260-page introduction to Aboriginal writers who have, since the 18th century, been taking up the English language to make their presence felt in the face of an imposed history of colonisation. The writing included is broader than the genres often included under 'literature', though the anthology as a whole suggests a national counter-narrative. The early parts record Aboriginals experiencing European society from early in the history of contact. The first entry is a brief letter to Mr Philips from Bennelong, written in 1796. It is written with dignity, tolerance and formality as it describes a parlous life of reliance on handouts and rebuffs from his own people, including being abandoned by his wife. Soon afterwards her husband, Walter, wrote again to the Secretary: '... I did nothing to make Doctor Jeanneret put me into Jail but because I was one of the people who signed the Letter for to be sent to the Governor and because my wife put her name down in it both Doctor Jeanneret and Mrs Jeanneret Called her a Villain ... All I now request of his Excellency is that he will have full Justice done to me the same as he would have done to a white man ...' The name, D. Jeanneret, worthy of a place in a Monty Python sketch, reverberates. In 1964 Oodgeroo Noonuccal expressed her concern for her people as fringe dwellers, for the discussion of Aboriginality had moved on from the fate of a conquered people to the place that Aboriginality might find within mainstream Australia. The wider story here is that of a people resisting the genocidal impulse of an invader. In 1967 Vincent Lingiari, leader of the Gurindji people, wrote, 'In August last year, we walked away from the Wave Hill Cattle Station. It was said that we did this because wages were very poor (only six dollars per week), living conditions fit only for dogs, and rations consisting mainly of salt beef and bread. Equality as citizen, soldier, woman and worker had to be won inch by inch from white society. The later selections detail the flowering of memoir, fiction, plays and poetry as Aboriginal writers engage with contemporary culture. There are brilliant examples from Larissa Behrendt, Lisa Bellear, Tony Birch, Alexis Wright and Kim Scott to name only a few. One has a sense that there is a growing Aboriginal audience for this writing. The editing achievement of Anita Heiss and Peter Minter is a signal to the wider culture that Australians have more than one story to tell. Kevin Brophy is Associate Professor of Creative Writing at the University of Melbourne. His most recent book is Mr Wittgenstein's Lion. His poems have appeared in Best Australian Poems and other publications. From 1980 to 1994 he edited the small press literary journal Going Down Swinging. Jeff Waters relates the death in custody of Mulrunji Doomadgee on Palm Island and the acquittal of the police officer involved. Mulrunji's death reflects a nationwide context where cherished institutions of western democracy are unavailable to many Indigenous people. From its opening scene, The Band's Visit strikes a tone that is at once funny and sad. The film prods cross-cultural disparity for humour and stirs the humanity of its simple story.